NOTE: Lance Adams refers to Balham Tunnel as it was originally called. 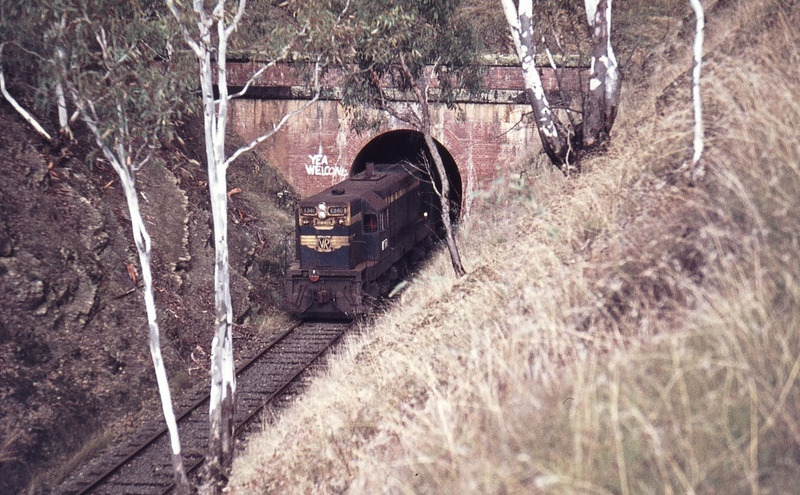 It is now referred to as Cheviot Tunnel. 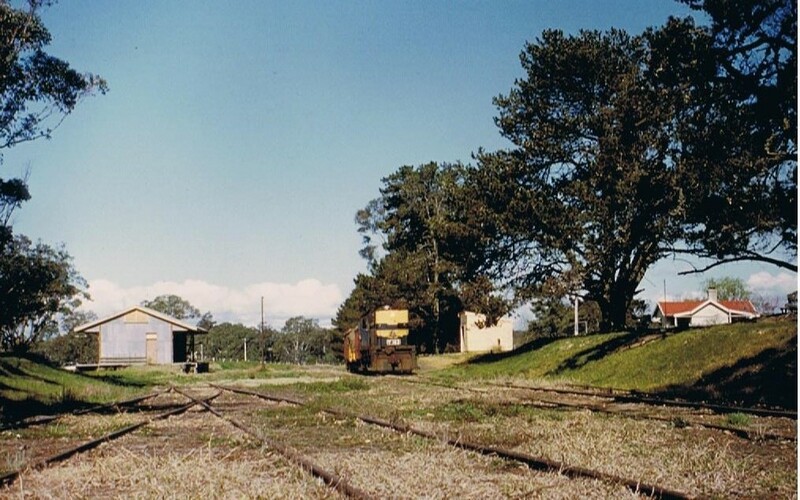 In the 1960’s, in an attempt to reduce superphosphate dust &amp; noise in the confines of the Yea Railway yard, during unloading, superphosphate traffic was diverted to Cheviot, and the remains of the Superphosphate unloading shed, can still be seen, on the left hand side of the former siding. This area, in and around the Cheviot Station precinct was totally devastated in a bush fire, that went through this area, in January 1969. The charred trees in the area are the result of this devastating fire event. You leave Cheviot after passing over a road crossing and negotiating a 600 metre left hand curve. Now the assault on tunnel hill (Balham Hill) up to Cunningham’s gap, commences properly, with long gradients of a 1 in 40 inclines, going through a series of mainly 600 metre curves as the trail climbs to the tunnel mouth. A 1000 metre and a 600 metre curve as the tunnel is approached via a straight section of line and numerous cuttings. The tunnel is at an altitude of 496 metres above sea level, is 203 metres in length. It is a 1 in 40 uphill gradient outside the tunnel, easing to 1 in 60, up gradient, inside the tunnel proper. This easing of the gradient, immediately inside the tunnel, gives an optical illusion of the gradient going down hill but it doesn’t. When you proceed through the tunnel itself, you will feel the gradient rising, until exiting its confines. 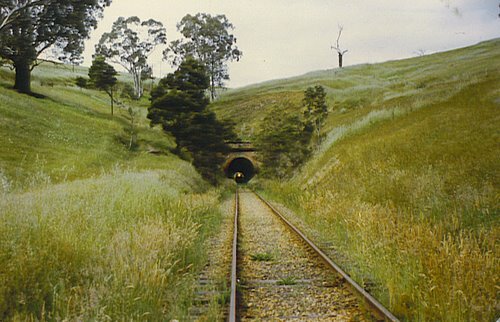 The area around the tunnel was devastated by the January 1969 bushfires, resulting in many roads in the area having to be deviated. These deviations can still be seen today with many roads still truncated to the 1969 profiles. The bricks for the construction of the tunnel, were kilned on site. The actual brick kilns are in an area to the left, about 250+ metres from the line behind a woolshed. The kiln is located approximately 200+metres before the tunnel itself. The kiln site is still in existence. The site where the clay was quarried for the bricks,is now a graziers dam and can be easily identified today. The kiln complex was connected to the Tunnel construction site by a push powered tramway, delivering the finished kilned bricks to the work site as required. 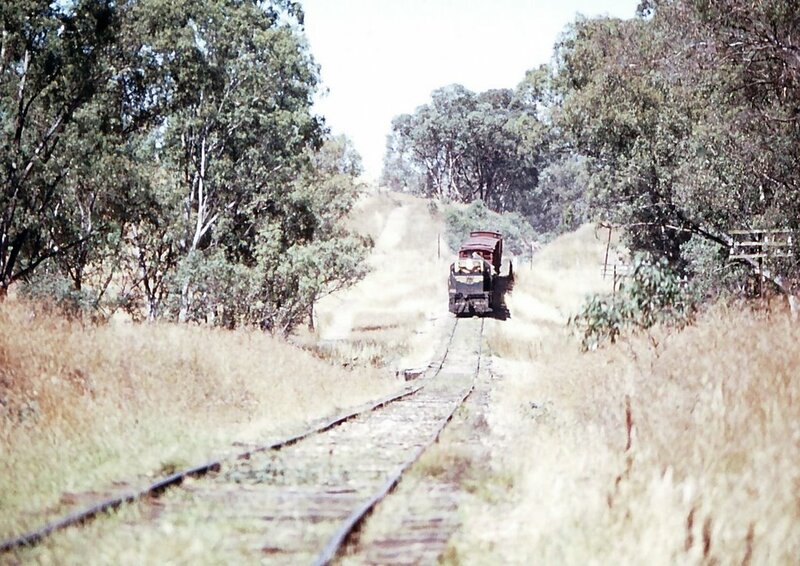 The formation of this construction tramway can still be identified today at the Yea end of the tunnel at certain times of the year, due to soil disturbance and the changing of grass colour. During the construction of the tunnel for the advancing rail head, a blasting mishap occurred. This resulted in the instant death of one worker. A second worker died of wounds he received in this mishap. He died in a Melbourne Hospital, sometime later. The worker instantly killed in the blasting accident is buried in the Old Cemetery in Yea. A wooden headstone was erected at the time by his fellow workers. The tunnel is exited by a deep cutting on a 600 metre right hand curve, easing to 800 metres on a steep 1 in 40 downgrade. 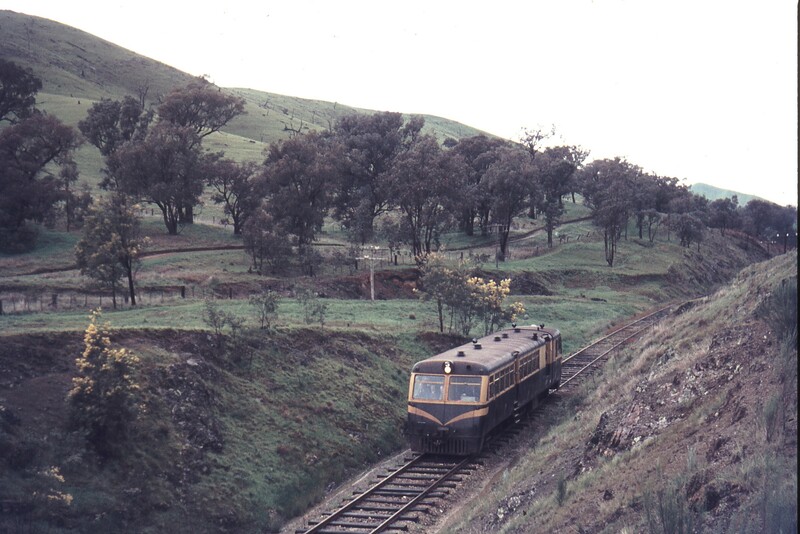 Then crossing a disused roadway deviated by the January 69 bushfires and into the former Balham station on a 1 in 200 downgrade. 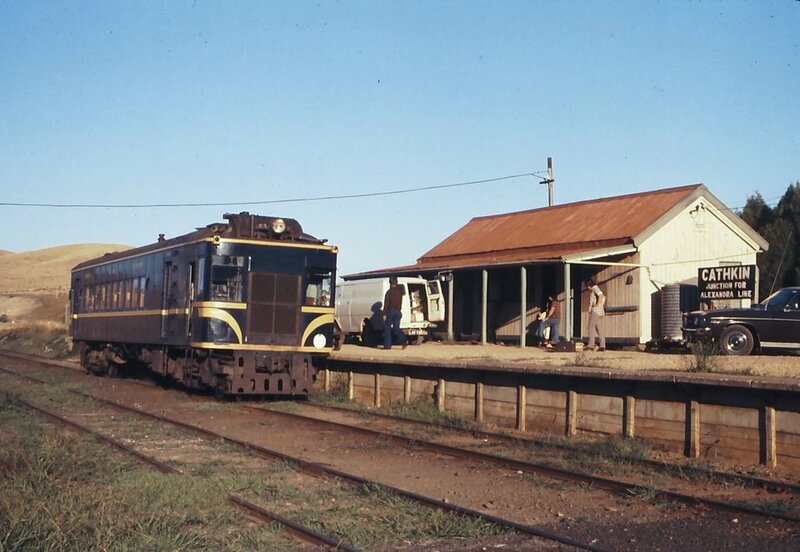 Balham was built as a construction siding during the construction of the line. The only apparent user of this installation was the nearby Balham Homestead. The homestead applied for the facility to be upgraded to full station standards. The Railways Department insisted that the homestead foot the bill, which they refused to do. The Railways Department responded by removing the siding completely, obliterating the site off all maps. Leaving Balham behind us we go onto a 600 metre left hand curve. After crossing over a roadway we enter Harvey’s Gully, still descending in long drops of 1 in 40 gradients. 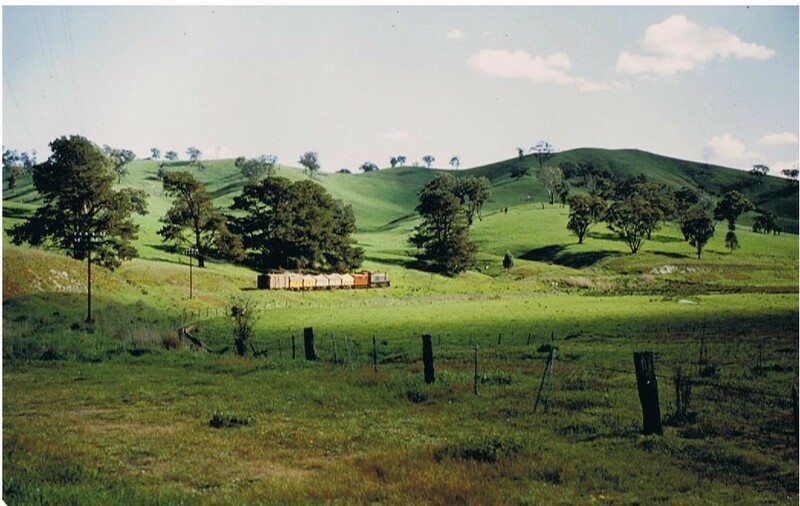 Harvey’s Gully was the scene of a fatal train smash in 1910 when an axle broke on the morning train to Mansfield. 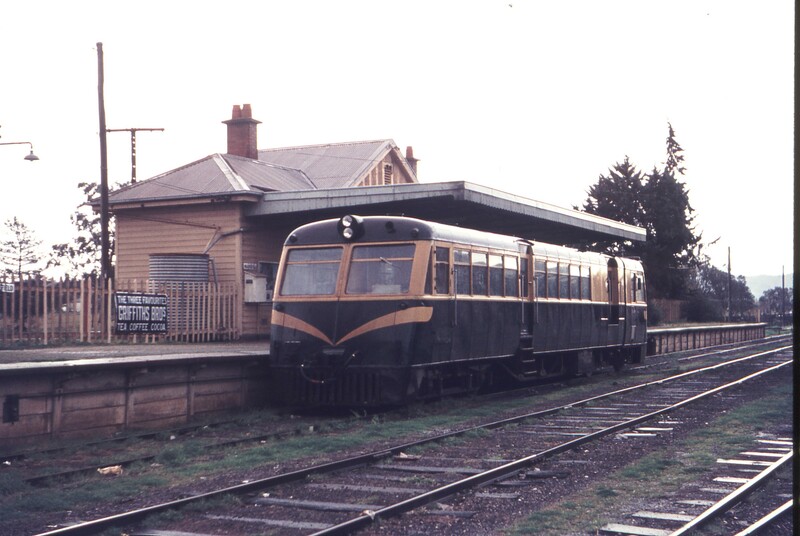 The accident caused a carriage to tip off the bridge into Harvey’s Gully causing the death of a passenger on the train. A local visiting the scene of the fatal accident souvenired a surviving piece of wood from the ancient six wheeled carriage. He made a wooden collection box with the wood and attached a handle to it. The box is still in position at Saint Lukes church in Yea. This church is situated near the Yea Railway station, thus preserving a historic piece of Yea Railway History into modern times. Molesworth Altitude 387 metres above sea level is a small settlement, boasting a store and a hotel. The Hotel has a selection of photographs of the railway in operation on display in the Bistro area. Well worth a visit. One small anecdote regarding the Molesworth Station is that when it was constructed the constructing engineer was dismissed. He was dismissed for using excessive quantities of explosives in blasting out the goods yard area. Rather than building the design the other way round requiring only a fraction of the explosives, thus reducing costs. The results of excessive blasting are clearly visible today. The water tanks at this location were replenished regularly by running the Cathkin based engine out from Cathkin.They would pump water out of Home Creek into lineside tanks for use by the through trains. A steam driven pump attached to the locomotive was used to pump the water out of the creek. These pumping duties for the Cathkin engine appear to be its main duties. Consequently the locomotive clocked up the lowest engine miles worked per week in the state. I have never seen or heard of this process being used elswhere. I don’t believe it was common practice by the Victorian Railways. These arrangements appear to have remained until 1909 when the line finally reached Alexandra. The tanks at Cathkin where then decommissioned. At this point the Cathkin engine and crew were reassigned and added to the Yea work roster. The workload had increased in Yea due to the newly opened line into the Alexandra township. The line continues on a slightly rising gradient of 1 in 2649 before sweeping through two long reverse curves. One of 600 metres radius and a second, a short distance in advance of 800 metres radius. The area through here was totally destroyed in 1973 when a freak flood caused a significant damage to the track. The track had o be totally reconstructed from Molesworth through to Cathkin. The formation now heads up a slight gradient of 1 in 3000 via a left hand long 1200 metre radius curve. Another right hand 1200 metre radius curve, which after crossing a local road enters the Cathkin Station area. Beware of Tiger snakes here! Cathkin, altitude 394 metres above sea level, was the changing point and junction for trains heading to Alexandra. The man who was the station master here for 38 Years was James Dunn. He was a successful published poet with many of his poems relating to railways and trains on this line. One of his books of poetry “Beside a Mountain Stream” is readily available from shops in the local area. Leaving Cathkin and crossing the main road to Alexandra the formation takes a sharp left hand curve of 300 metres and begins an ever sharpening rise before entering a lengthy right hand 1200 metre curve. The line enters a lengthy straight section, where after entering a 800 metre curve, the line crosses underneath the re-aligned Maroondah Highway from Alexandra.The bridge crossing the Maroondah Highway was constructed in 1971. The line heads in a downward direction for about two kilometres before it again begins to rise up a 1 in 220 gradient. The assault on the Merton Gap has begun!. The line continues its steady upward climb heading straight until two reverse 600 metre curves takes the journey into Yarck. Yarck is left behind by a set of two 600 metre curves bringing the trail back on to an alignment which is parallel to the Maroondah Highway. While continuing an uphill assault on the Merton gap, the trail negotiates gradients as steep as 1 in 68, and 1 in 40, whilst crossing several farm access tracks in the process.This section, whilst uphill has very few curved sections in it, after leaving the curves departing Yarck proper. The first curve that is encountered, is a long curve of 2000 metre radius. Another curve of 1200 metre radius is some distance ahead, while still climbing steadily, with another 2000 metre curve and a small downhill section crossing one of the few wooden trestles left on the line. 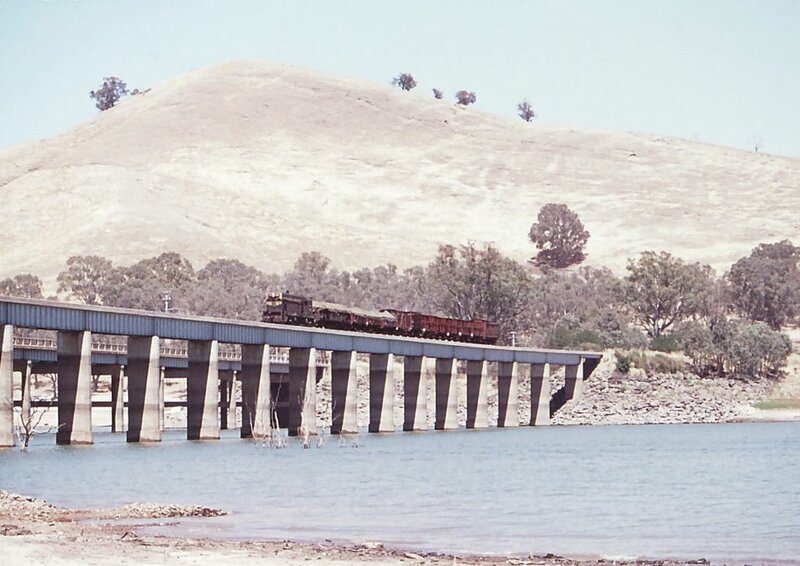 Other crossings were all replaced by concrete and steel structures in the mid 1940’s ready for the expected increase in heavy traffic, with the Eildon weir project getting underway in the early 1950’s. Two 2000 metres and 1200 metre curves bring you into the Kanumbra station area. Kanumbra (Altitude 390 metres above sea level) is just a whistlestop, with no shops, hotels or stores present. From here on the formation swings away from the Maroondah Highway and the long climb to the top of the Merton Gap begins. After crossing a rural road, Kanumbra is left behind by a 600 metre right hand curve.After crossing another rural road a left hand curve of 500 metres is met as the gradient continues and weaves a path up a series of 500, 680and 800 metre curves. Another series of curves can be experienced further up the incline towards the summit. These curves are 600 and 800 metres respectively, with a final curve of 1600 metres, before you reaching the summit. The summit of the Merton Gap has now been reached. 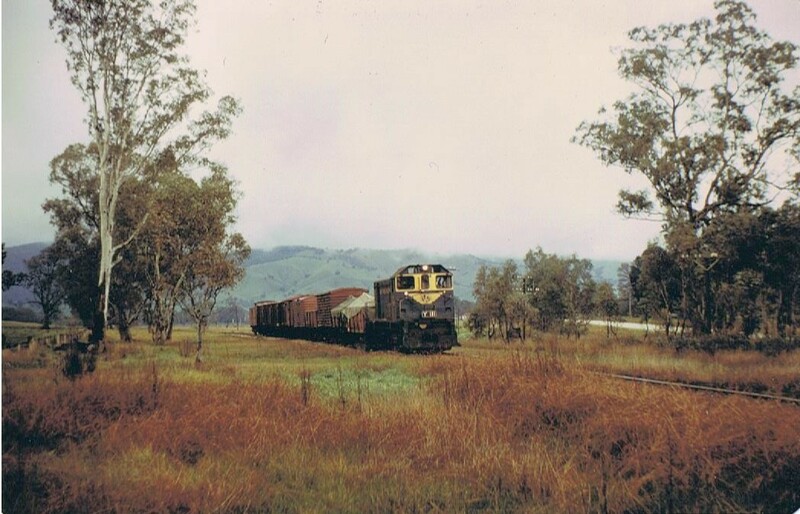 Merton Gap (Altitude 610 metres above sea level) is the highest point on the railway from Tallarook to Mansfield, and is at the top of the Great Dividing Range. The disused road that can be seen in this location is the former Maroondah Highway, re-aligned in the 1950’s. From here, a steep drop is experienced down a 1 in 40 gradient, with the current highway on the left and the disused old re-aligned highway on the right. While enjoying the relief from the constant previous uphill gradients several rural roads are encountered, whilst swinging through an array of curves of 600, 800, and 1000 metres, until a third road is crossed. The bottom of the incline is near! After going round a 1200 metre right hand curve that leads you into a 600 metre right hand curve, the trail swings around the top of the hill above the main road to the left, the Merton cemetery is on the right. You are now outside the Merton General Store/Roadhouse. There are no other establishments in Merton and anything that is required must be sourced at this location. The Merton station area is entered from a long 500 metre curve and was the temporary terminus of the line during construction in the 1890’s, before the line finally reached Mansfield in 1891. Merton was a watering point for steam locomotives in the early years of operation. 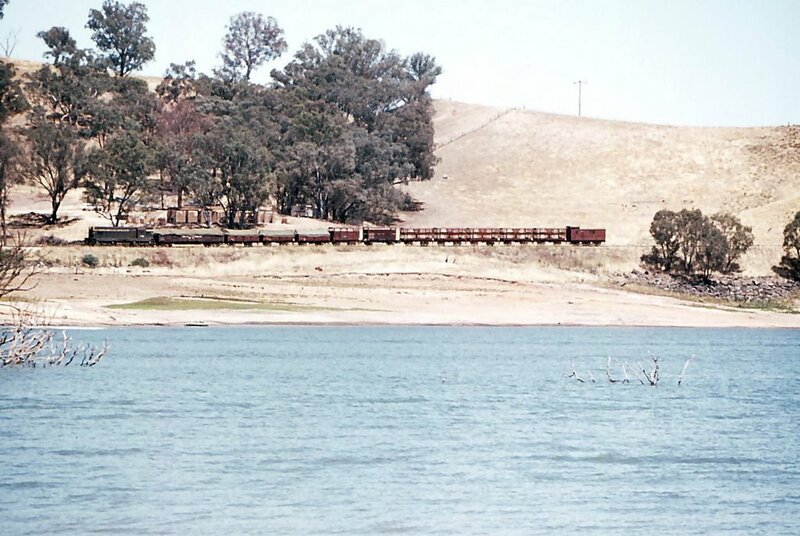 However it had its water facilities removed with the introduction of the more efficient “K” Class locos in the mid 1940’s. Merton (altitude 538 metres above sea level) has no accommodation facilities for travellers. Merton is left after passing over a road crossing and going around a long 400 metre curve and corresponding reverse 400 metre curve to bring the alignment back parallel with the Maroondah Highway again. It proceeds in a downhill direction for several kilometres, whilst negotiating two curves of 800 metres and 2000 metres, emerging onto a 800 metre curve, incorporating a crossing of the Maroondah Highway which now swings to the right hand side of the trail and continues downhill for three kilometres.This is followed by two 400 metre curves, as well as a 800 metre curve. The formation then rises for a short distance and crosses a rural road on a 1 in 40 grade. The formation now drops into Woodfield station area via a 800 and two 400 metre curves. The beginnings of the Eildon Reservoir will now be visible on the left hand side, should the Weir be at its high watermark, further on if it is not. Woodfield (Altitude 510 metres above sea level) has no facilities for tourists passing through. The trail leaves Woodfield by crossing a roadway and heading straight on level terrain for about 2 kilometres, when a series of 3 curves are faced, a 800 metre and two 600 metre radius curves, and the trail swings to the right. 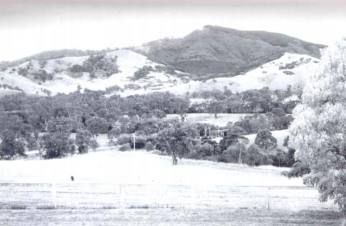 It was at this point, to prepare for the construction of the Eildon weir, the original line formation was deviated in 1954, to service the re-located township of Bonnie Doon onto higher ground, secure from the rising waters of the Eildon Weir, with the swelling of the Brankeet Creek, which the original settlement was situated around. When the reservoir is low in drought conditions, as they were in the early 2000’s, the remains of the original settlement, become visible again. The trail now continues in a slightly downhill direction, when a sweeping left hand 30 chain radius curve is met, and the trail arrives into the Bonnie Doon Station area, with the former passenger facilities on your right, and goods area facilities on the left. Bonnie Doon (altitude 520 metres above sea level) Bonnie Doon is now located 30 metres higher than the original foundation settlement after the valley was inundated to create the Eildon Weir. The township has all the facilities a tourist might need except medical services which are provided by Mansfield some 20+ kilometres away. Leaving Bonnie Doon you enter a sweeping right hand bend of 800 metres and then travel through several deep cuttings and tight curves. You are then at a location on the side of the Lake behind a tourist Motel. The trail then rounds a sharp right hand curve of 800 metres which leads to the approach of the modern lake crossing. The modern bridge, constructed between 1954-55 is part of the deviation required due to the flooding of the original Bonnie Doon township and the Brankeet Creek. The whole area around where the lake is now situated was totally changed in 1954 and has a completely different appearance the original area. It is also a modern haven for those interested in watersports and water type recreational activities. The area includes a large modern Hotel/Motel complex accessed on the Mansfield Side of the lake crossing. Worth a visit! The Lake is crossed, on this modern concrete and steel bridge opened in 1955. The trail heads sharply up a grade steepening to 1 in 40 towards the top of the gradient, in an area known as “Hangmans Gap”. The trail then traverses a road by an old trestle overbridge arrangement and rejoins the original formation from near this point. The gradient apex is on two curves of 360 and 600 metres. From here the trail begins a downward descent of 1 in 40, with a long 600 metre curve at the bottom of the gradient, then crossing a roadway at the same time where a wooden overbridge used to stand. The formation now commences a further short sharp rise with a lengthy 1000 metre curve on the top of this rise. The trail now commences another downward direction and crosses a rural road on a straight section of trail. It then leads onto another roadway crossing then swings into two curves of 400 metres. This then leads onto another roadway intersection via a lengthy 1000 metre curve and enters the Maindample station area. Maindample (altitude 520 metres above sea level) located near the Maroondah Highway, at this location was re-aligned to eliminate two dangerous level crossings in 1970. The Highway now keeps to the right hand side of the trail rather than two individual crossings as was the previous case. A fully functioning modern hotel services this location and can be found at the extreme Mansfield end of the town limits. Maindample is left behind by a 400 metre left hand curve and a right hand curve of 1000 metres which leads into a small straight of 1.5 kilometres. The trail intersects the Midland Highway along the straight section before negotiating a right hand curve of 800 metres which then leads into a straight section while gently rising on a gradient of 1 in 158 after crossing a rural roadway in the process. The formation heads straight ahead continuing on an gentle uphill gradient, The trail then crosses another rural road until a gentle 600 metre left hand curve is encountered. The trail levels off then heads in a downhill direction on grades of 1 in 40 and two kilometres straight running before crossing a major road and negotiating a 1200 metre right hand curve. Midway down the gradient two 800 metre right hand curves are met. Just before the bottom of the gradient the trail then straightens up. 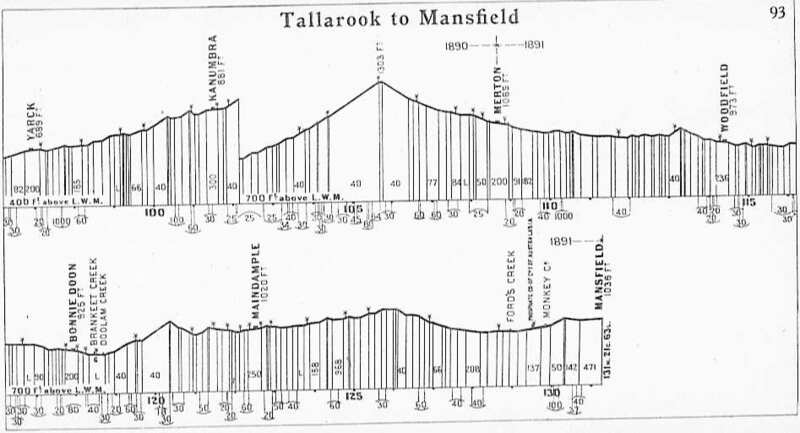 The gradient now eases to 1 in 200 and commences a long gentle approach to Mansfield over a rural and Fords creek. This area was devastated by a bushfire in the 1990’s. The trail then starts to gently rise up a 1 in 137 gradient passing the site of a former phosphate siding. 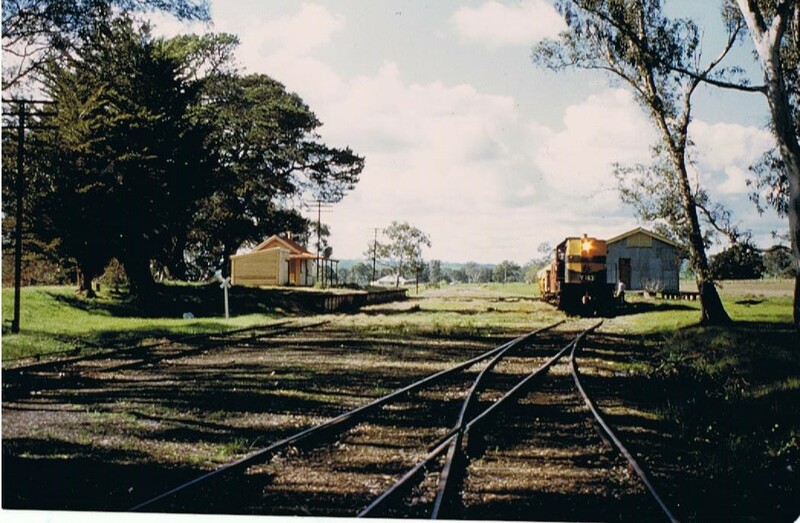 The trail now rises up a short rise of 1 in 50 gradient and enters the Mansfield Railway Station area by a 2000 metre left hand curve which then sharpens to a 740 metre curve. 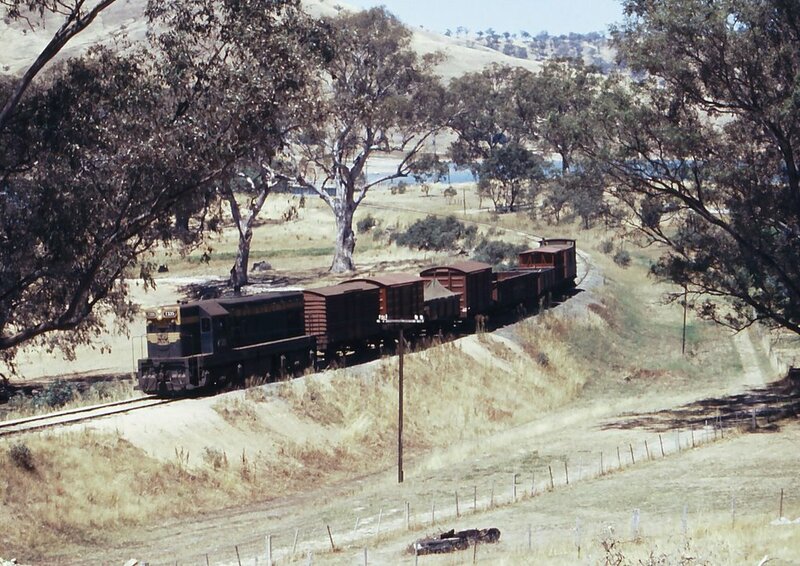 The trail then straightens before a 800 metre curve and then begins the final descent into the Mansfield Station Area on a gentle downgrade of 1 in 142. Mansfield (altitude 521 metres above sea level) with a population of app. 3000 has all town facilities, including cafes, hotels and medical Ssrvices. 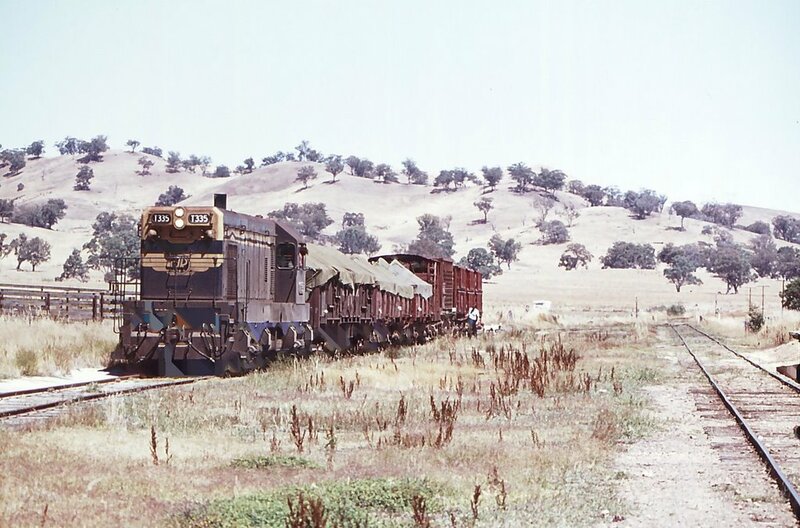 The end of the railway is 211.5 kilometres from distance 0 in Melbourne.